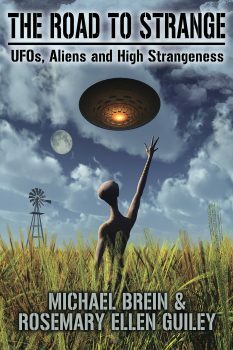 The Road to Strange: UFOs, Aliens and High Strangeness is the new book from Michael Brein and Rosemary Ellen Guiley. It’s a book which is filled with literally dozens and dozens of cases of the ufological kind. Those cases cover such issues as crop circles, alien abductions, pilot encounters, Men in Black, UFO landings, and much more. But, it’s very important to note that this is not just a collection of events and incidents. Rather, the emphasis is on how the experiences impacted on the witnesses themselves. This is a good, solid and refreshing way of demonstrating to the reader the way in which the UFO phenomenon can affect people – and not always in a positive way. The same goes for their families and friends. Ridicule, fear, denial, amazement, and paranoia are just some of the results of the close encounter cases in The Road to Strange. Let’s take a look at the content. Seeing how people deal with such matters – or don’t – makes for revealing reading. As for the reaction of family members, well, at one end of the spectrum there is the sense that their relative is mistaken, lying – or, of course, telling the truth. At the other end of the spectrum, though, there’s the tragic story of T.L. Murdock who, as a child in 1931, was “backhanded” with “full force” by his mother for claiming an encounter with something strange in the sky. This, of course, was long before the dawning of the flying saucer era in 1947. Sheppard noted the reluctance on the part of colleagues to talk about UFO encounters, “even though I knew other pilots and flight engineers had seen UFOs.” Sheppard tells a fascinating story of how, decades ago, he was aware of a kind of unwritten code of silence among air-crews when it comes to UFOs. Again, we get to see- first-hand – how the phenomenon of the UFO alters lives and directs their beliefs and approach to the mystery. One of the most interesting stories revolves around a bizarre encounter with dwarfish humanoids floating in self-illuminated “pods of light” in the direct vicinity of Wiltshire, England’s famous Silbury Hill. It’s one of those cases which is hard to fit into any particular category. Fear, denial and and an attempt to rationalize the incident by suggesting it was connected to a “military exercise” or “a projector” are all part and parcel of a story that undeniably changed lives. High-strangeness in the heart of crop circles is an important aspect of the book and our authors note that those visiting the formations experience drowsiness, a feeling of “cosmic connection,” and “mystical rapture.” Men in Black of a clearly supernatural nature pop up, too – in a North Carolina library, and who appear to have the ability to affect electrical equipment. The menacing MIB reports and the crop circle cases demonstrate just how weird certain UFO-themed events can become – and they too are shown to profoundly affect those in close proximity. Add to that stories of missing time, alien-human hybrids, strange “holes” in the sky, an incident at Area 51, and much more and you have a book that makes for absorbing reading. I have often said that the most important people in the field of the unknown are not the writers, the authors, the radio-show hosts, or those who appear on TV shows. The most important people are the witnesses. A great deal can be learned from studying them, their reactions, their words, and how their lives have been changed, altered and even scarred. The Road to Strange does a great job of getting right to the heart of what it means to be a UFO witness.